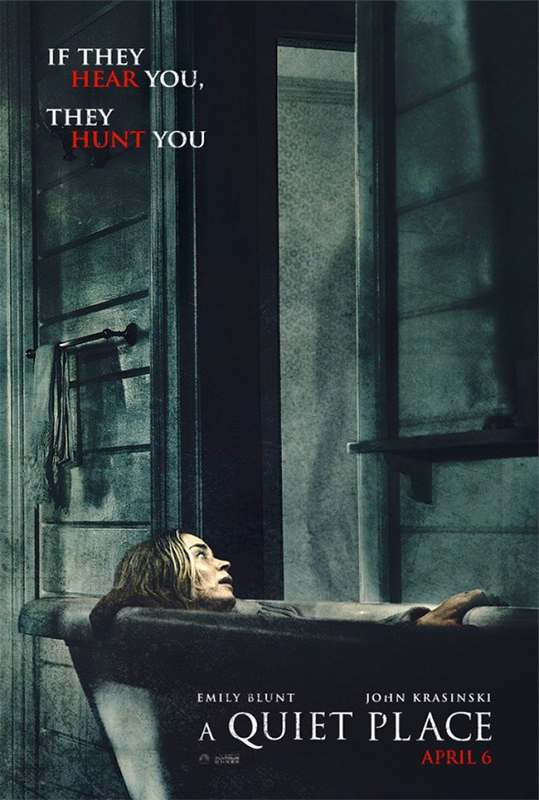 John Krasinski directs and stars in the new horror-thriller, “A Quiet Place”, along with his real-life spouse, Emily Blunt. The actor/director has had no experience working in this genre, so it is quite surprising that he has been able to craft such an effective, tension-filled creature feature. Set in the near-future, humanity has been mostly wiped out by large-blind creatures that will find you if you might make even the slightest sound. The Abbot family, which consists of Lee (Krasinski), his wife Evelyn (Blunt) and their two kids Marcus (Noah Jupe) and Regan (Millicent Simmonds) live on a farm and spend their days following a routine. Lee gathers food, including fish from the stream. He brings along Marcus so that he can teach his son how to take care of the family. Evelyn, does daily chores around the house as well as home schools’ the children. Regan, who is deaf wants to be trusted more by her father. Marcus doesn’t want to leave the safety of the farm, but Regan wants nothing more than to prove she can handle things. In the film’s opening moments, the Abbot family lost one of their family members to the creature and we learn right from the start just how dangerous the world this family lives in really is. If they didn’t have it hard enough before, they will now, because Evelyn is pregnant. During much of the film’s duration, all I could think about was how are they going to keep this baby from making any noise once it is born? There is a plan in place, but it’s not desirable. “A Quite Place” works for a-number-of reasons. The main ones being the direction by Krasinski and his cast. Everyone is wonderful here, most notably Simmonds who is deaf in real life. There is hardly a world spoken in the entire film, so most of the communication is done through sign language. The characters spend quite a bit of time living in fear. Every little movement can be a risk. A simple task like picking up a bottle of pills can attract the creatures. Walking barefoot on sand while outside is a must. Although I didn’t find “A Quite Place” to be scary, I did find it to be quite intense. If you are looking for a thrill, I can’t recommend this one enough.